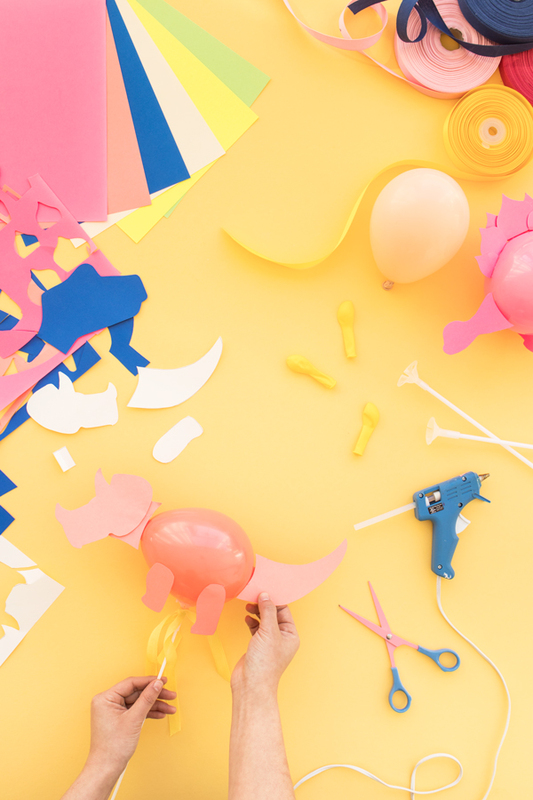 Step 1: Print and cut out the dinosaur template of your choice onto colored cardstock. Step 2: Inflate a mini balloon that matches your cardstock with a balloon hand pump. Fold back along the dotted line for the head and tail pieces. These tabs will be where you attach the head and tail to the balloon. Glue one arm to one side of the balloon, repeat with another arm. The balloon should be sandwiched between the legs. Repeat with the leg pieces. 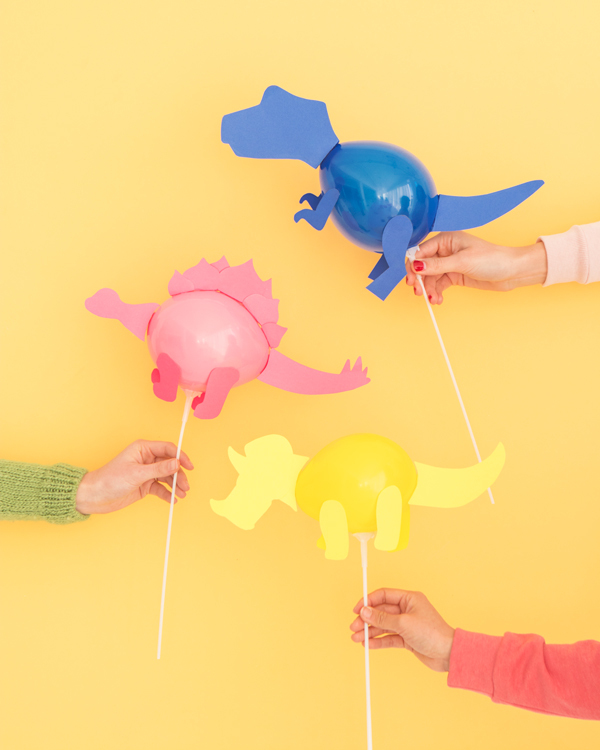 Attach a balloon stick by hot gluing the balloon cup to the bottom of the balloon. Fold back along the dotted lines for the small rectangular pieces. Hot glue one end of the rectangular piece the back of the head piece so that the other side points 90 degrees downward. Hot glue the other rectangular piece to the tail. Fold along the dotted lines of the six spikes pieces. Slightly overlap 5 spike pieces and hot glue them together in an arch, with the largest piece in the center and the smallest pieces on the ends. Hot glue the tabs of the spikes to the balloon. Glue a balloon stick to the bottom of the balloon. Glue the neck to the back of the head piece so that a small margin is peeking out. Use the greyed area on the neck template as a guide for how they should overlap. Fold back along the dotted line for the small rectangular pieces. Glue one side of the rectangular tab piece to the back of neck piece. Glue the other rectangular tab to the tail. Hot glue the head, tail, and legs to the balloon, then attach the balloon stick. Omigosh these are so cute! Perfect for a party! It’s a great alternative to all the gold letter balloons going around! The instructions say to hot glue the balloon cup to the balloon. 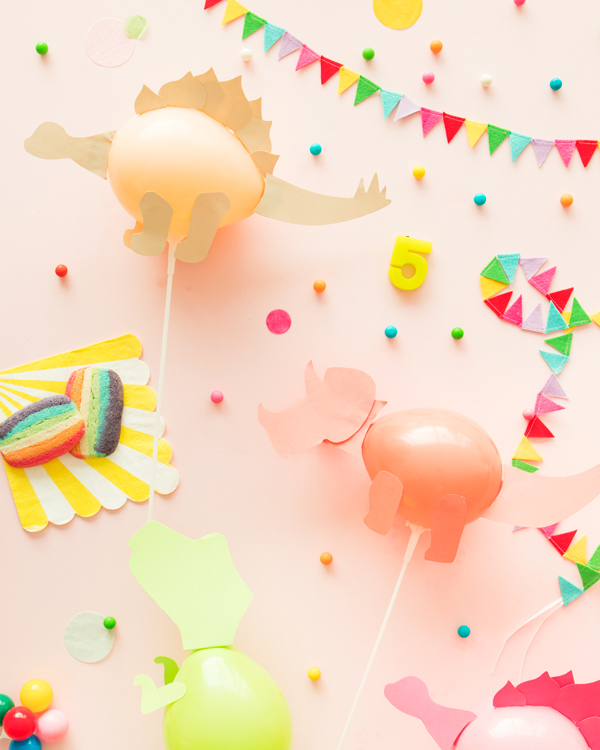 Won’t the hot glue pop the balloon? Surprisingly… no! We use a low-temp glue gun and it works great. Aw! Such a sweet little idea! Love this! 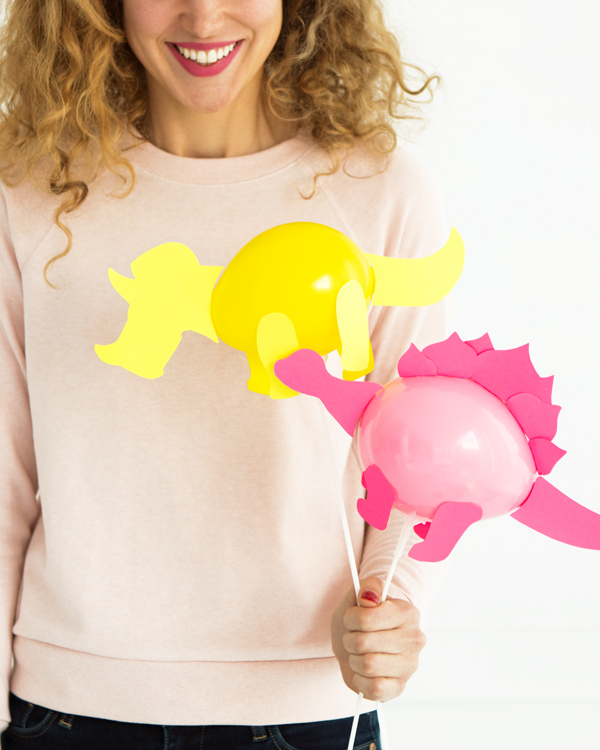 these are so cute.. now I gotta convince one of the boys to have a dino themed party! What a fantastic idea! 😀 I’m lovin’ it!